A year ago, PhD student John Rula accidentally left his smartphone in a taxi. After exiting the car, he checked his pockets multiple times only to find them empty. That’s when the anxiety set in. 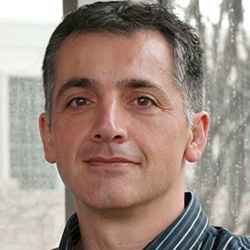 Rula relayed the incident to his adviser Fabián Bustamante, a professor of electrical engineering and computer science. They discussed how many people perhaps rely too much on their mobile devices and feel separation anxiety when it’s missing. Inspired by the conversation, the duo decided to develop an application to help people control this “dependency”. After multiple iterations, Bustamante and Rula came up with Application Time, or AppT, an app that enables its users to track, monitor, and analyze their mobile device usage. The team hypothesized that most people look at their phones mindlessly, without realizing how much time they spend on different applications. 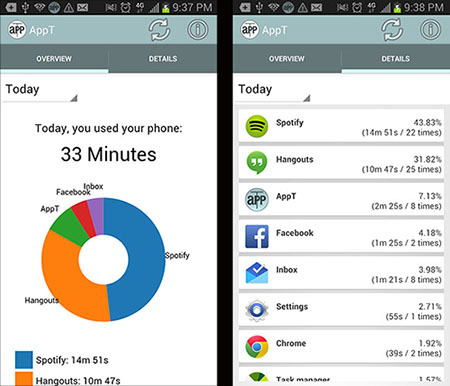 Now available for Android in the Google Store, AppT runs every time the phone’s screen is on. Every 1.5 seconds, it records which app is in the foreground. It then displays visualizations to show which apps have been used, how frequently, and for how long. And because AppT has very low demands and does not run when the screen is off, it does not drain the phone’s battery. Rula used AppT for a year, and what he discovered surprised him. He found he used a chat and messaging app more than 11,000 times over the course of a year, averaging about 23 times a day. And most of his usage occurred in the afternoon — right in the middle of his workday. While AppT helps people monitor their own behaviors, Bustamante and Rula believe that what they learn through this new tool can also potentially be used to improve future applications and mobile devices.